I have two bird feeders and two bird baths in my yard and love spending time watching the birds that come visit me daily. Summer and winter, I've spent many enjoyable hours identifying the species, watching the little ones grow up, and laughing while they line up on the deck rail to get their turn at the feeder. When Downtown Bookworks offered me a chance to review PBS Kids: Look and Learn Birds by Sarah Parvis I couldn't resist. How fun would it be to share my love of birds with one of the youngsters in my life!? Little did I know that I too would improve my bird-identification skills. 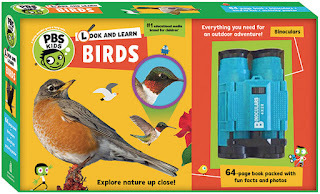 The PBS Kids: Look and Learn Birds kit comes in the colorful box shown above and includes binoculars, an activity poster, a laminated list of common birds in North America, and a small book to help a young birder get started on a new hobby. The book and activities are appropriate for kids 4 years old and up. The first thing I noticed about the book was that the birds are all shown in photographs, not drawings, which I think is brilliant. Sometimes the drawings in bird-identification books are difficult to interpret. Photos are so much clearer. Next, I was impressed with the thoughtful range of birds covered in the book. Whether you live in the city or country, on the coast or inland, in the East or in the West, you'll be able to find birds common to your area. No child is going to be disappointed because the birds she sees in her yard aren't covered in the book. 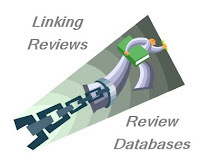 It's also important to me that the information Parvis provided is not watered down. Children (and adults) will learn real tips for bird identification--for example, what kinds of details to look for, how birds' coloring can change with the seasons, and how to tell male from female. The laminated quick ID card, is also geared to young birders across the continent. There is a robin and a cardinal, but there's also a gull, a pigeon, a scrub-jay, a duck, and a couple of hawks. I'm posting this little card near my bird-watching spot to see how many come into my yard. Finally, the activity poster (which you could hang up or frame) shows photos of quite a number of birds and then asks ten questions that can be answered by looking at the pictures. 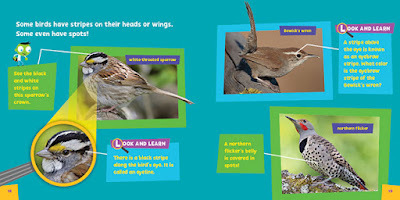 These activities are appropriate for very young kids, asking them to point out which birds are flying or which have black heads, for example. As your youngster learns more about birds you (or he) could come with more questions. 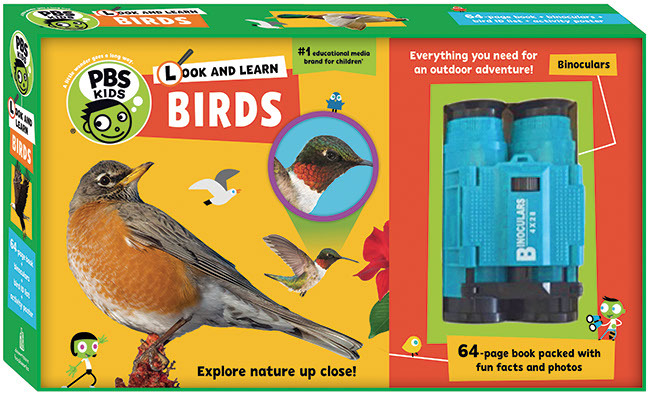 The PBS Kids: Look and Learn Birds by Sarah Parvis is a great way to get your children interested in nature and eager to go on a daily walk, with binoculars and book in tow. The kit is perfect for gift-giving: birthday, special treat, or Christmas. If you home school, the kit would make a great science unit. I have a special young neighbor who likes to watch the birds at my feeders. I can't wait to give her this kit and increase her interest in learning more about nature and science. 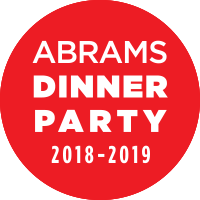 If you visit the Downtown Bookworks site you'll see that PBS Kids also has a Look and Learn Insects kit that comes with a magnifier jar, booklet, activity poster, and identification card. As the marketing material for these kits say, they "take the nature walk to a whole new level!" These are great little kits, we bought a similar one for our son to get him started when he was young. Like you, we have feeders and birdbaths and love seeing the varieties of birds that visit. This is an excellent gift for a child - birthday or Christmas or anytime! Yes yes yes re the drawings in bird-identification books being difficult to interpret! Photos are much better! I love birds! Maybe something for me and my grandchildren to do look at together.